"Pink Space and the Chess Game We'll Finish Some Time" acrylic painting on paper by Sheldon Killie. "Side Effects" acrylic painting on paper by Sheldon Killie. 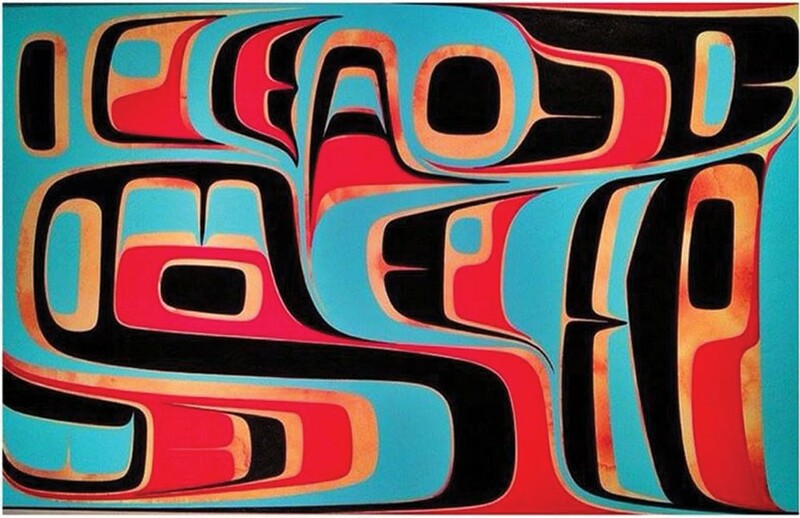 A relative once told painter Sheldon Skillie that if he listened closely to the language, songs and dances of his Native American Haida culture, he would see them reflected in their visual art forms as well. He followed that advice, imbuing the lines of his paintings with the movements of his language. While Skillie's confident, crisp images undulate upon his paintings like rhythm and melody, he confesses that his work is not necessarily informed by traditional dancing. Instead, he says with a wry grin, "I grew up breakdancing." And so go the cultural complexities that rest upon the immediate surface of Sheldon Skillie's paintings. Ancient forms morph into contemporary compositions, carving stories in a modern world that only faintly resembles that of previous generations. However, with the right kind of eyes, Skillie's images move much deeper than the surface, exposing the intricate ways in which contemporary cultures balance on a knife's edge between past and present. Opening this weekend at the Black Faun Gallery, Skillie's first solo show, Letters to my Ancestors, promises "modern movements in ancient motifs." His description fits the work well. Skillie's paintings are deeply informed by the strong Pacific Northwest Native imagery of his Haida roots, yet rest on a concrete foundation of graffiti, skateboard ramps and hip-hop beats. Indeed, Skillie is no stranger to the conflict of traditional life intersecting with the 21st century. Growing up in the sleepy grays of Seattle, Wash., Skillie soaked up the urban scenes. Yet as a Native American, he felt consigned to the fringes, peering into a life that seemed out of reach. At 10, he moved to Ketchikan, Alaska, home to the Haida people and mountains that yawn from pristine fjords and rainforests. "We were of course welcomed with open arms by family," he recalls, "but I always felt like an outsider." He wasn't familiar with the local traditions and his ignorance weighed on him. "I always wanted to participate [in Haida culture] but I never felt entitled to it." As a member of a highly respected family of artists, he sought to understand as much as he could about Haida narrative imagery. No matter his desire, Skillie felt that he could not tell his family's stories since he had never learned the sensitive protocols involved. Once again, Skillie found himself on the margins. After a brief stint at Portland State University and numerous odd jobs up and down the West Coast, Skillie was asked to apprentice for Norman Jackson, a working artist back in Ketchikan. The apprenticeship mirrored a more traditional form of education, and "something started to resonate." Jackson's experienced guidance gave him confidence. Skillie finally found his visual voice. A decade later, Skillie leans his tall, slender frame on a table in his Eureka studio. Close-cropped hair peeks out from under a beanie, and his hands fold neatly in front of him. In a slow, confident cadence, Skillie continues explaining his work. "What I'm doing is taking [Haida] art — my understanding of it — and telling the story of this Haida." However, Skillie feels there are things about today's world that are impossible to explain through a visual system created thousands of years ago. How does one describe busses that bend in the middle as they roar down the road, or homeless people that sleep in the streets? In the past, Skillie says, Haida culture was so strong that there was no need to speak about fractionalized societies or poor and hungry people. "The traditional iconography doesn't have any precedent for expressing something like a tribute to people who are lost or on the margins," he says. So he has to reinvent it. Skillie pulls a gray-scale, acrylic-on-paper piece out from a stack of paintings. It's inspired by a Native American street artist he knew in Seattle, filled with references to doorways, buildings and city spirits. Titled, "The Last Time I Saw You You Were Weaving Stories Out of the Grass that Grows in the Cracks of the Sidewalk," the image is composed of four main quadrants. Ovoid forms establish eyes on the lower left, looking across to the shape of a raptor's beak on the other side. Thin gray streaks slice the beak, repeating across other parts of the painting like a fading timeline. Lively shapes spring up, growing into mountainous peaks across the top of the work. Dry brush strokes fly from under the heavy form lines, waving in the wind like the grass in the title. 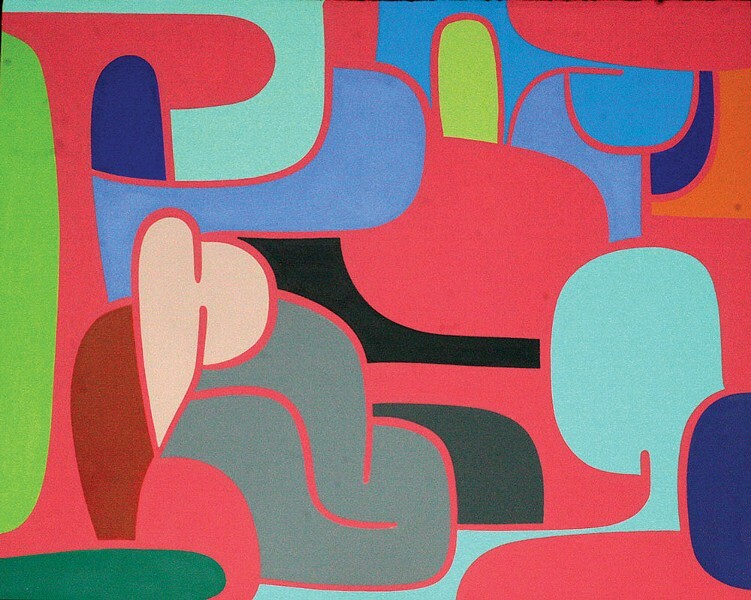 Elements of totemic symbols blend with a '50s-modern-art nostalgia, while thick lines and the interplay of positive and negative shapes bring to mind graffiti and contemporary graphic design. "I'm taking the signal of the culture that can be expressed through art and running it through modern effects," he says. Today's world is complex; the stories can be difficult to tell and even harder to listen to. "I feel like somebody's got to tell it, though ... it's not all ideal tradition. There are sharp edges everywhere." In a way, Skillie's work isn't so different from his ancestors. Their crests and totems were never exact representations of the natural world. "I think it's always been a tradition of Haida art to adapt and evolve," Skillie says. "What I'm doing isn't new or novel, but just continuing a tradition." Sheldon Skillie will have an opening for his new paintings from 6-10 p.m. during Arts! Alive at the Black Faun Gallery, 120 Second St. in Eureka. Black Faun, next door to Mantova's Two Street Music and half a block from the C Street Studios, is a fairly new, yet essential stop on your Arts! Alive walkabout.